Is there, really, any more iconic fruit when it comes to autumn time than the age-old, wonderfully nourishing, and splendidly healthy apple? Pears, my second favourite fruit (raspberries take first place, if you're curious - though the fruit that I eat the very most of in a given year would have to be strawberries, which I also adore), come close for sure and indeed, the two often go hand-in-hand. Yet it is the apple - be it tart and green, mellow and golden yellow, juicy and red, or sweet and garnet hued - that takes top billing and which is as tied to fall as harvest moon, pumpkins, crunchy jewel toned leaves, and the return of chilly nights. Apples are an amazing fruit. They're rich in both antioxidants and fiber, and can provide a lasting sense of satiety - as well as being a truly delicious food. In addition, apples have been an integral part of our collective human history for millenniums now, having factored into the the mythology, religions, and legends of a good many cultures, spanning the ancient Norse and Greeks to the central role they play in the Christian bible as well. Few amongst us are without both personal memories and elements of a cultural identity that relates back to apples. We have expressions aplenty that include this juicy round fruit (such as, "The apple doesn't fall far from the tree", "As American as apple pie", and "An apple a day keeps the doctor away"), associate them heavily with education (including the classic practise of leaving the gift of an apple on a teacher's desk), and have been eating (and drinking - apple cider or Calvados, anyone?) them in countless recipes for many, many centuries now. Apples are a fun, cheerful fruit and one that is tied heavily many fall time celebrations, including both Halloween and Thanksgiving (the Canadian version of which happens today this year). They're perfect "as is", and yet work equally in both sweet and savoury dishes, too. Over the years I've shared several different vintage recipes that included apples (such as Rosy Apple Pie, Creamy Gala Apple, Butternut Squash and Carrot Soup; and Maple Syrup and Apple Bread Pudding topped with Sugared Apples) and thought that in celebration of the fact that autumn's return is a mere ten days away, I would roundup some of the most mouth watering, classic, cutting edge, and/or unique apple recipes I've ever encountered online. Each of these dishes is a stellar treat that puts the season's abundance of apples - of which there are thousands of different varieties the world over - to good use. Naturally, they can all be made at other times of the year, too, but as I'm a firm believer in eating, and cooking, with an emphasis on the very foods that each season presents us with, now seems like the ideal time to delve into not one, not ten, not thirty, not even fifty, but seventy-five flat out magnificent apple recipes that are ideal for fall. It's hard not to work up an appetite just reading through this selection of fifty fabulous apple recipes! Do any of them jump out at you in particular? Aside from the age old classic that is caramel apples and all of the variations on such presented here, the Apple Pie Tacos and Crispy-Skin Duck with Chargrilled Apples in particular are really beckoning to me at the moment. As apples have been heavily and heartily enjoyed (and grown) in many parts of the world for centuries now, they're actually one of the most frequent types of fruits that you'll encounter in vintage and antique cookbooks, with recipes for classics such as apple pie, apple sauce, apple muffins, apple crisps and buckles, and apple butter, to name but a few, stretching back for hundreds of years at this point. A true icon of the season and one of the most delicious things to ever grow on a tree, so long as you enjoy and can (from a medical standpoint) safely eat them, apples deserve a place not just on teachers' desks, but on all of our tables come the sublimely beautiful days of late summer and straight on through to the iciest months of winter. Embrace apples, get creative with them, and let them shine for you and your family all throughout fall, when they're truly at their finest in western hemisphere and when no other fruit says autumn quite like this humble, satisfying offering from Mother Nature does. *PS* Happiest Thanksgiving wishes to all of my fellow Canadians! My goodness Jessica! Every photo looks delicious!! Is it any wonder why autumn is treasured? Warm comfort foods, festivals, beautiful foliage and Halloween!! I hope you are enjoying this magnificent season as much as I am. Thank you for the fantastic post! XOXO. What a lovely way to speak about autumn, dear April. I completely agree and certainly share your view on this season being a wondrous treasure. It is such an amazing gift from Mother Nature, as she slips from her sundress into her ski coat for another year. I am in my element and savouring fall something fierce right now, too. It's fantastic that you are as well. May it continue to be a magnificent chapter of the year for both of us. Apple nachos ? Really ? I have to say I was sooo surprised. I never imagined this, then again in cooking its just your imagination and your taste buds.. I am currently working on oregano recipes, my garden in full of huge green oregano leaves that I have to used up ! I'm thinking oregano pesto.. Isn't that a cool idea? It makes one wonder what other types of fruits would work well as the base for "nachos". I'm thinking peaches and pineapple might both be fun options. How wonderful that your garden is abounding with oregano. It is one of my favourite herbs both to eat and to work with medicinally. I can just imagine how lovely your home and yard must smell right now, rich with the earthy, subtly sweet aroma of oregano. I have pinned a few of these. Now, not to get fat with all the wonderful recipes of the season! Serendipity: seeing this post just moments after trying to figure out what to do with the pork chops I took out of the freezer. Why not try recipe #66? ;-) Thanks, Jessica! You are sincerely welcome, my dear. What a lovely spot of happenstance. I'm delighted to have been able to assist with your autumn dinner plans. Wouldn't it be amazing (albeit likely over multiple years) to give everyone of these amazing apple recipes a try? That's a challenge I'd happily tackle (with fork and knife in hand :D). Those are some mighty awesome recipes, particularly the desserts! A lot of people in Upstate NY go apple-picking at this time of year, and there are several organized trips in my area. It's also traditional to eat apple slices dipped on honey on Rosh Hashanah, and many of us enjoy hot apple cider with cinnamon sticks during the upcoming holiday of Sukkot. This Rosh Hashanah, one of my rabbis gave a d'var (loosely translated, talk) about how apples can only grow in a place like NY instead of California or Florida. They need both distance and closeness to properly grow. In a state that's sunny year-round, they wouldn't have the required cool nights in addition to sunlight. Aren't they though? I just adore the creativity of the folks who so kindly shared these amazing apple recipes on their respective sites in the first place. It is beautiful that apples play such a strong roll in certain Jewish holidays. What a very apt message from one of your rabbis. It certainly speaks to how humans grow and flourish as well. Thank you deeply for passing it along to us here. Thank you sweetly for doing so, dear Hope. I always appreciate Pinterest love and am delighted to know that several of these scrumptious apple dishes jumped out at you (they really did for me - and, delightfully, I can safely eat some types of apples, so they're nearly always to hand in abundance at our house). Quite the catalog of apple recipes! They're such a tasty and versatile food, no wonder you were able to put together so many tasty sounding recipes. I'll have to try some of these out for sure! Oh, so do I! I can't say as though I've had too many recipes over the years that married cream cheese and apples. The pairing is very appealing and I've bookmarked that recipe to make asap. Thank you very much for your lovely comment. Have a splendid week! They really do looks/sound sublime! A good self-basting dessert is hard to beat. My mom and I used to make a few such sweet treats from Taste of Home magazine back when I was a teenager. There was apple sauce, but not an apple dessert or main dish. Plenty appear on our table throughout the fall though, very much including the classic marriage of apples and pork. Often we have had apple pie, apple cake, baked apples or another apple dessert over the years at Thanksgiving (and they're always part of my Halloween menu by way of caramel and/or candy apples). 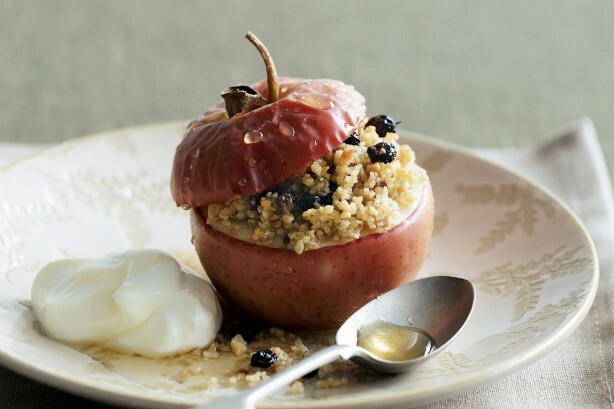 Are you planning to make any fun apple recipes yourself this season? phew! thats a whole lot of yummy apples recipes! just bought 2.5 kilos of that healthy fruits - the farm up on the hill sells the smaller/bumped on ones for 30 cent per kilo! thank you for searching for all that gorgeous apple ideas!!!!! It is quite a few, isn't it? I was filled with an immense zeal for apple recipes while putting this post together and very nearly kept going to 100 or more (it would have been a breeze), but didn't want my readers here to be scrolling through them until springtime, so I capped it at "just" 75. :) Who knows, maybe a few years down the road, I'll put together "round two" of this fun apple recipe roundup post. How cool that these expressions are common in the Flemish language as well - I wonder now, what other countries/languages do they appear in? I'll have to ask Tony if they're part of the Italian vocab as well. How awesome that your BF will be spending Thanksgiving with you guys. If ever there was a holiday to be with those you love and count amongst your blessings, Thanksgiving Day is it. I hope that you all have a beautiful, fun filled celebration. Some gems here, Jessica! I only wish we had cooler weather for some of the more autumnal style treats. Thank you very much, my dear. Perhaps an apple ice cream or chilled slice of pie to help beat the ever hotter heat south of the equator? Spiced apple cider served chilled over ice cubes made from the very same cider itself can go a long way towards countering spring/summer's scorching temps, too (and goes awesomely with grilled foods). yummy! I am saving the grilled cheese and the apple pie bourbon shots for ever and ever! thanks for all these wonderful recipes. Aww, you're super welcome, my lovely friend. I love apple grilled cheese sandwiches sooo much. If you eat it, bacon (or turkey/chicken/vegetarian style bacon) added to the mix is incredible as well. Caramel apple is so famous, that's right! I loved the pictures, so delicious and inspiring and... made me hungry! Dear Jessica, it's again nice to know more about you, being raspberries your favorite fruit, then apples and pears... I like strawberries too, like you. I confess that I know that the apple doens't fall far from the tree :) and so, I am very much like my mother - eating sweets, preferrably. Not good, really not good. I know that an apple a day keeps the doctor away :) Hahaha and still, I eat three apples a year... but although I don't like new year's resolutions, I have to have one for 2017. To eat in a better way. I loved the apple crumbles with berries and an apple bread? Wow. I will try some recipes, for sure! Hope you have a very nice day! Hugs and regards! It most certainly is, sweet Denise. Such a delicious, gooey treat and way to celebrate the apple harvest. It's fascinating, isn't it, how our eating habits and preferences often largely mirror those of our parents. My mom's favourite fruit is blueberries though - close in a sense to raspberries, but of course not quite the same. They certainly work nicely together though and both can play wonderfully with apples at times, too (in oatmeal, pancakes or muffins, for example). I'm drooling all over the keyboard!!! I have to hand it to you North Americans, you "do" apples like no-one else. So many different ways - and apple fries!! I'm enjoying the cool fruits of your part of the globe as the days warm up here, thanks, Jessica. What a cool observation, dear Elizabeth. We do certainly have a proclivity for this classic fruit, it's true - and having grown up in a region that grows some of the largest volumes of apples in Canada, I really feel like they've been an integral part of the culinary landscape all throughout my life. Are apples grown in many parts of Australia? Dear Jessica, Oh, my...WOW...75 apple recipes...this is like an Apple Cookbook! It must have taken a lot of work to do this post. Hope you & your family had a wonderful Thanksgiving!! Yum!!! Caramel + chocolates + pecans is truly one of my favourite flavour combinations ever. Add apples into the mix and my knees almost buckle. :) How lovely that you enjoyed that terrific treat recently and that it made you think of me. You're such a dear! Oh, mon Dieu de la france! I could stay here in front all day, this post is heaven for me! I love the smell of baked apples, and spices that make them good company. Apples are exceptional even in savory recipes, perfect with pork but the cakes are fantastic, thanks Jessica, this is the autumn that I love and today is the sun again! Wonderful point, dear Serena. Apples have such an amazing scent in nearly any form - raw, baked, roasted, grilled, coated in chocolate or caramel, mashed into a juicy sauce, as cider, the list goes on and on. It's such a classic scent, too. Something that we as a species have been enjoying for centuries upon centuries upon centuries now. I love it so much and could scarcely imagine autumn without this iconic aroma. Thank you very much for your lovely comment. I hope that the rest of October is marvelous for you guys! I'm not much of a cook, but these recipe posts of yours always make me want to try my hand in the kitchen! Apples are, IMO, a very forgiving ingredient to work with - especially since they tend to take so well to long, slow periods of cooking/baking. Perhaps that's part of their age old appeal. I hope that any apple recipes you try out this season (and beyond) turn out splendidly for you, my lovely friend. Do some of these recipes pop-out to me? They are tearing up the rooftop of my mind! So many delightful recipes, so many amazing ideas. I'm overwhelmed, that's what I feel. Apple brownies? I say: perfect item to make for a Saturday's family get-around. Each of us takes a bit or two, and I'm sure they will all vanish in a instant. And, as far as breads go - the apple fritter bread looks anything but a plain loaf of bread... it's an elaborate, delicate - I'm sure amazingly tasty treat! Hello my dear friend! I really appreciate you repeating your thoughtful Thanksgiving wishes here, as I've not had a chance to see your original Instagram message yet (this week is so incredibly busy between Thanksgiving, three family birthdays, and our wedding anniversary, plus shopping, cooking and baking for those events). Hoping to catch on recent comments there at some point this month. Thank you so much!